Childhood best friends Bassam and George have grown to be men in war-ravaged Beirut. Now they must choose between the only two futures available to them: to stay in the devastated city and consolidate power through crime or to go into exile abroad, alienated from the only existence they have ever known. Told in a distinctive, captivating voice that fuses vivid cinematic imagery, a page-turning plot, and exquisite, dark poetry, De Niro's Game is an explosive portrait of life in a war zone and a powerful meditation on what comes after. It won the prestigious International IMPAC Dublin Literary Award in 2008. 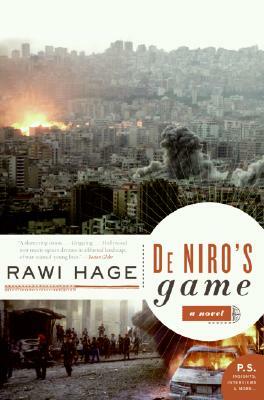 Rawi Hage was born in Beirut and lived through nine years of the Lebanese civil war. He is a writer, a visual artist, and a curator, and he resides in Montreal. First published in Canada, De Niro's Game was a finalist for that nation's top literary prizes—the Scotiabank Giller Prize, the Governor General's Literary Award, the Writers' Trust Award, and the Commonwealth Writers' Prize—and won the McAuslan First Book Prize and the Paragraphe Hugh MacLennan Prize for Fiction. “...vividly evocative of the chaos of conflict and the moral confusion of young men. “...a soaring, lyrical triumph...this novel isn’t reportage; it’s troubling and transcendent art.